There used to be a sort of stigma associated with Christian-rockers. They just weren't taken seriously. The first generation of Christian rockers (not counting Bob Dylan's temporary foray into Christianity) was the heavy metal Christian rock band of the '80s: Stryper. Stryper was pretty much dismissed as a "comic book" version of heavy metal. Let's face it; heavy metal IS about scoring with girls, partying and more scoring with girls. The bands downfall came as rumors that the band had succumbed to the very antithesis of their so-called squeaky clean image, being the very hedonistic lifestyle that is associated with heavy metal. Fast forward to 2002. There is a new generation of Christian-rockers. Yes, they are serious; yes, they are sincere; yes, they CAN play, with a ferocity that is on part with secular rock bands. But no, they don't preach hellfire and damnation in their lyrics. While they may not "pay their dues" in smoky bards, they do get enough gig experience at church functions and "clubs" that cater to the new Christian bands. 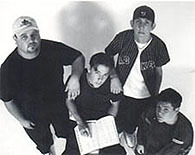 One such new generation Christian rock band is Sunder, hailing from Conyers, Georgia. While their mission statement is to "further the kingdom of God through the ministry of music", they don't hit you over the head with heavy messages. If you didn't know outright that they were Christian-rockers, you might not guess it from their live performance. Sunder infuses punk, emo, praise and heavy rock with lyrics that deal with personal spiritual conflict as well as social issues such as divorce and avarice. I talked to the band at their first "regular" club gig at Rockfest. I must say that I was a little bit prejudiced by their label of "Christian rockers", but was very impressed once I saw them play! E.C. : First off, how long have you guys been together? Sunder: Since February of 2000. E.C. : How many gigs do you do? Sunder: We've been playing a whole lot this year, averaging at least once a month. E.C. : You are based in Georgia? E.C. : Since you are a Christian rock band do you have a problem getting gigs? Sunder: For the most part we've only played at Christian places, this is like the most non-Christian place we've played [Rockfest] at so far. We usually don't have problems. There's been a lot more Christian venues around lately, so it’s been a little easier. Sunder: Stryper! (all laugh) Its grown a lot bigger and changed a lot more...its mainstream. A lot of other bands have crossed over, kinda paved the path for us to come in and play secular venues. A few years ago a place like this probably would have been scared if we'd had said "Christian". E.C. : So, are you straight forward about your Christianity when you book gigs? Sunder: I mean our promo pack says it...if they won't accept us as Christians, we've decided we don't wanna play there. We're not going to hide anything, we're not going to deny our faith. E.C. : When you write the songs, of course you have a message that you are trying to get across, but do you try to make it NOT sound preachy? Sunder: Three of us write lyrics, and all of us kinda approach it differently. As far as I'm concerned I don't intentionally go to make it preachy, but I write lyrics that I feel strongly about, whether it be Christianity or something different. What I'm feeling at the time...we take it a song at a time. We have songs about girls, songs about God. E.C. : Basically trying to relate to your audience without being preachy? Sunder: Exactly! Yeah, we've seen a lot of bands that are preachy and we feel like our niche is not in that vein. But, we have nothing but respect for those bands. It just not something that we are comfortable doing right now, its not something we set out to do at the beginning. E.C. : A lot of the Christian bands are getting mainstream radio play, are you shooting for that as a goal? Sunder: Our goals pretty much...we feel like we're doing this FOR God, its not really to be "rock stars". I mean if God takes us as far as where we want to go, if we get signed to a record deal, be it secular or not - that's fine with us. Our goal really is to have fun and to serve God while we're doing it. E.C. : Distribution used to be a problem with the labels that handled strictly Christian rockers. If you did find the CD, it would be something like $20! Sunder: Things have changed a lot, and secular labels are embracing Christian bands. Creed is not a Christian band persay, but they kind of opened up the aspect of spirituality in bands. They are still considered "Christian rock" by a record label standpoint. E.C. : What does the name "Sunder" mean? Sunder: The name Sunder - it is an actual word, contrary to popular belief (at least among our uneducated friends). It means to be split apart or separate. We kind of take it to mean that we should be "split apart" or "separated" from those things which displease God. E.C. : What is the future of rock 'n roll? And how does your band fit it? Sunder: Well, to hear the "present" rock n roll, which would be radio in general and "mainstream" bands, they pretty much all sound alike, look alike, no one wants to be original and mess up the formula for themselves. But people are growing tired of today's music, especially the youth, and they are the ones who will create the future of rock n roll. For that reason, we think underground music, both bands and labels alike, are the future of rock n roll. As far as where Sunder fits into this equation, we just want to be original, and stay true to ourselves and God. If we do that, we may never be "famous" or make it big, but we aren't making music for those reasons. E.C. : Finally, if you could realize one dream for your band, what would it be? Sunder: Well, among our many goals and dreams, we have put a lot of thought into starting our own independent record label, and opening a studio together, so either of those two would be a dream we would love to accomplish.